すみだ北斎美術館 - To experience a woodblock　print in many colors　WORKSHOPS HOKUSAI　“THE GREAT WAVE"
This is a page about To experience a woodblock　print in many colors　WORKSHOPS HOKUSAI　“THE GREAT WAVE" for the Sumida Hokusai Museum. 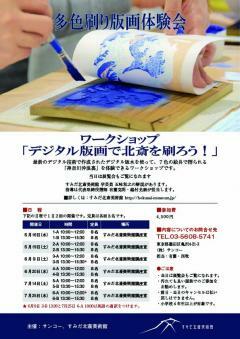 To experience a woodblock　print in many colors　WORKSHOPS HOKUSAI　“THE GREAT WAVE"
This is a workshop to experience “ Under the Wave off Kanagawa” by using a digital printing blocks, which are prepared with the most up-to-date technology. Participants will see the process of printing and experience printing by themselves. “Under the Wave off Kanagawa from the series of Thirty-six Views of Mount Fuji ” included in our collection was resolved by colour and based on its result, wood of cherry blossom was curved as a woodblock by digital laser. The production of Japanese woodblock print is a complex process involving steps, each performed Artist/Block Caver/ Printer. We can understand deeply about Ukiyo-e though those process.